There are thousands and thousands of different tartans, ranging from well known old clan, family, and district ones, to corporate, club, and commercial ones, to light hearted and fun ones; in fact there are probably tartans for just about any and everything these days, and the list is constantly growing. 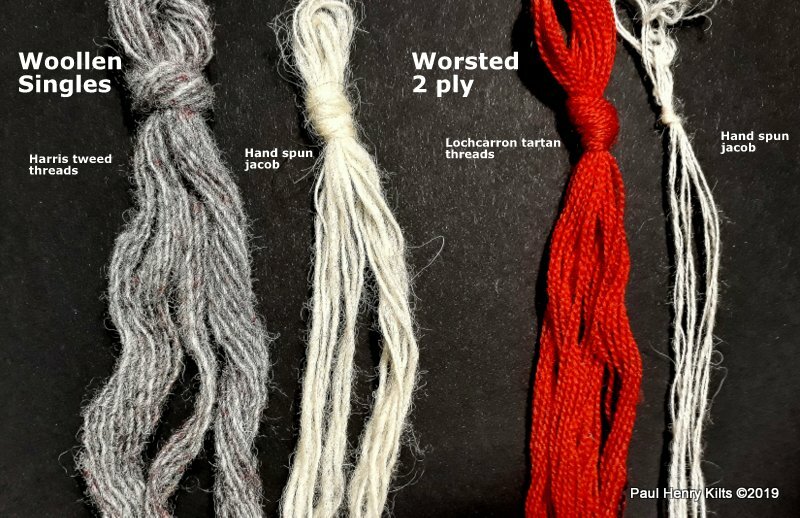 To identify a mystery tartan can be somewhat challenging but what has made it even more difficult is the added complication that many of these existing recorded tartans can be woven in a range of different colour palettes. These colourways do not actually change the name of the tartan as the threadcount – the actual formula for the pattern – remains unchanged . This threadcount sets out the number of each coloured thread in sequence, this list forms the basis of the sett when woven, making the recognised tartan grid and squares. Each colour has been given a code letter to make it read, so that B = blue , Y = yellow , R = red , G = green , K for black , W = white N = neutral/grey , there are others but these are the main ones. The difficulty comes when you choose a colour, there is no absolute tone/shade/hue for any one them, so that the weaver can choose whichever one they like, and this then leads to the added numbers of available options from even a simple tartan. 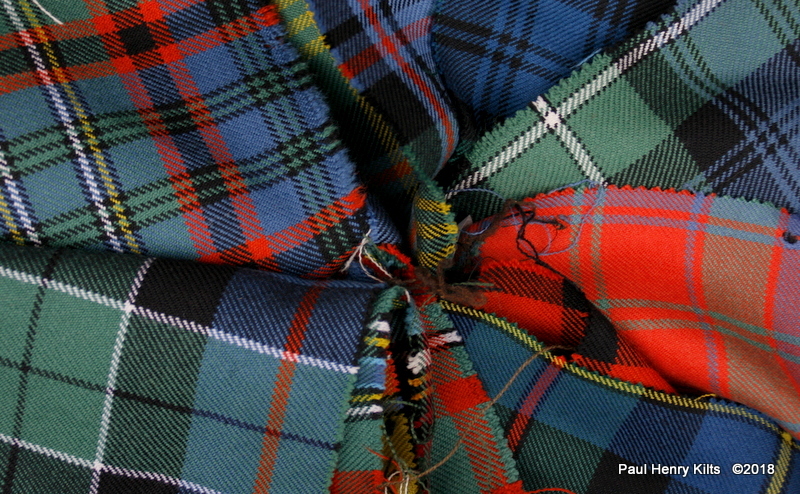 Early woven tartans often used local plants to dye the wool and the local weaver would produce cloth that would have become recognised as local cloth, it didn’t take long with trading to increase the available colours and there is evidence of many imported dyestuffs such as madder or indigo being used in Scotland from the 1400’s. The weaving of tartan before the 1600’s was more or less a simple village activity fulfilling the need for cloth, but as the population expanded a need for greater stocks of cloth increased and weaving began to turn into a more organised affair. One business which played a hugely important part in the widespread creation of tartan was William Wilson of Bannockburn – a town which was well known for tartan weaving. They were well established by the end of 1800’s and probably had been weaving for a considerable time before. They managed to create incredible quantities of tartans and it seems that they were very influential in the naming and classification of tartans. They were of course in business to sell cloth and it’s clear that on many occasions they weren’t above creating or renaming existing tartans to sell some extra yardage. They kept good records of the colours and threadcounts for many tartans and it is thanks to them that we know of and can duplicate many 200 year tartans. Their colour palette is now known as Wilson’s colours although rarely used these days except for special orders. People are often surprised that all these tartans were dyed with natural dyes and are amazed at how strong and bold they are. The next available colourway is known as Ancient, this colourway was created sometime around the 1950’s in an attempt to increase sales and is characterised by softer blues and greens, slightly orange reds, the overall feel is of an older cloth, which often creates confusion as it’s actually newer than the modern colours! There are other variations in colourways as well, Dress tartan is characterised by using a lot of white in the design, often in the larger areas of the background, this is very much a Victorian idea and was used for posh events largely by gentlemen who could show off that they didn’t have to worry about having white clothing, although today it is largely seen as more normal for ladies attire. A development of this lead to the dancing tartans which have a white base colour and often very bright colours, although seldom seen outside the world of Highland dancing. Hunting tartans fall into a slightly confusing category as well, some tartans are recoloured with more blues and greens, again a (mistaken) Victorian idea that it would give camouflage on the hills and moors , but also some Clan hunting tartans have an entirely different sett/design that doesn’t bear any resemblance to the typical sett. 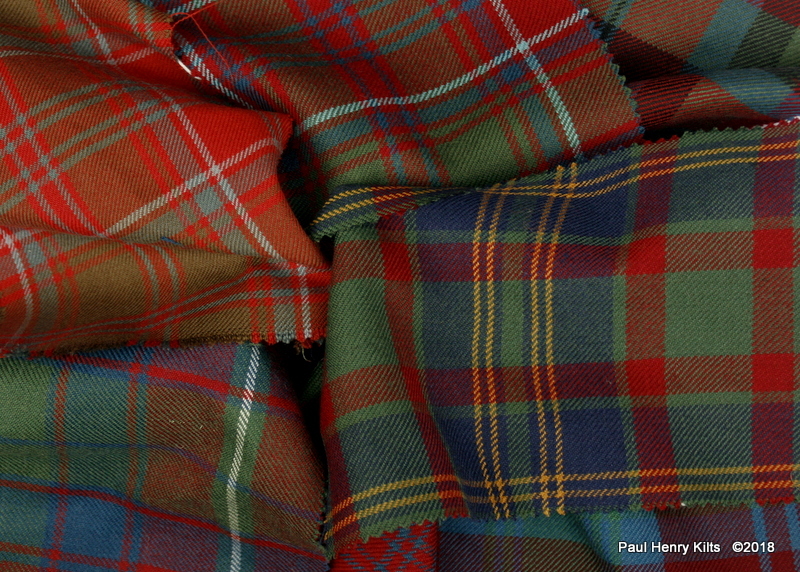 A final thought about the colourways of tartans, it is often better to use the modern/ancient/muted etc after the tartan name, so for example Buchannan ancient, rather than ancient Buchannan, as there is already an Old Buchannan tartan, which could in theory be produced in any colourway desired, so you could have Old Buchannan modern if you wished. No one said the study of colour and tartans was straightforward. Most people think that yarn made from wool is woollen, and in a general sense that’s not wrong, but for those of a fibre or textile persuasion it’s a lot more complicated than that, and this is just one aspect of the many things in the magical and wondrous world of wool, more will follow! To go back to very beginning most sheep produce usable wool in some way or another, there are hundreds and hundreds of different breeds of sheep and the colour, the quality, and quantity of wool produced is very varied. Man first started using whatever wool the sheep provided , but it wasn’t long before a gentle process of selective breeding came into play to provide the best wool or indeed the best meat, it wasn’t always possible to get both at the same time.The many breeds of sheep give varying lengths of fibre, many sheep give fibres between 2″ -4″ which is an excellent basic wool but the most highly prized is the longwool bearing sheep which can give fibre of up to 12″ or perhaps even more. 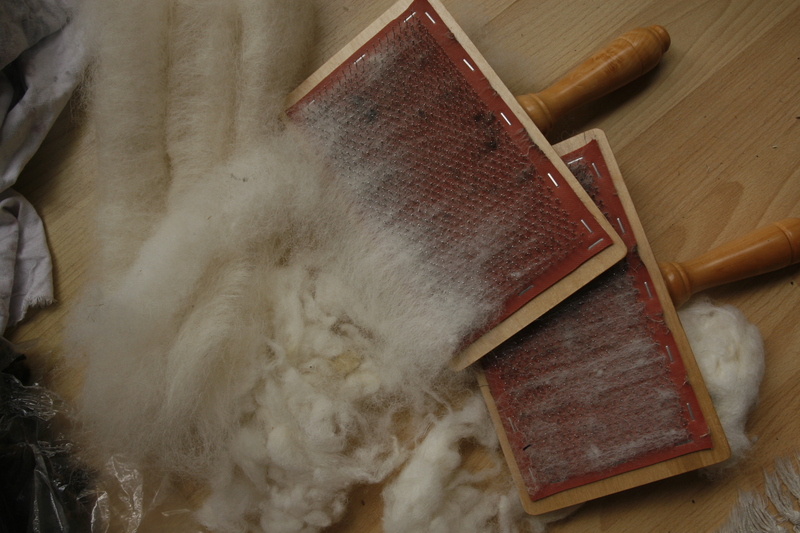 It is possible to spin directly from the fleece, but most spinners will clean or prepare the wool in some way to make the next process a little easier. General purpose wool for general purpose use is most likely to be carded after cleaning, producing a random mix of shortish and longish fibres, usually jumbled together loosely, what hand spinners call rolags. This uses almost all the available fibre with very little waste and is ideal for spinning yarn that is going to be used for knitting. There are different ways of spinning woollen yarn but handspinners use rolags, a loose sausage like roll of fibre, often some version of a longdraw method is used, this produces an open, soft and fluffy yarn, not always the strongest but excellent in making things for warmth. This type of yarn is called Woollen ( often woolen in the United States). 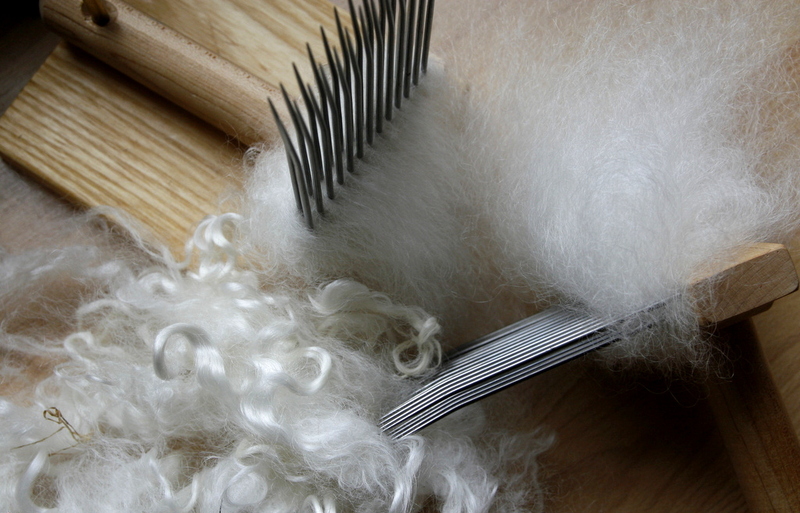 Long wool fibres can not be easily carded, they are simply too long and get caught up on the drum, so are combed instead using long spiked boards which separate the long and shorter fibres. The long ones are kept, shorter ones put aside and can be carded to produce a woollen type yarn, and spun into yarn using a shortdraw technique which produces a finer, harder and more even yarn which took the name of a village in Norfolk ( apart from a curious spelling change) Worsted. 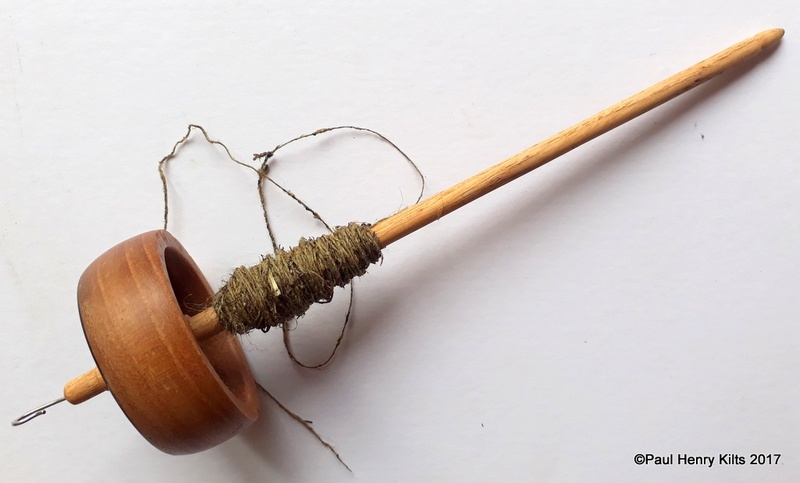 This method of spinning is a little slower, but the higher price obtained more than offset the difficulty. This is only a very quick view of the differences and there is a huge range between woollen and worsted yarns, infact many hand spinners produce something in between. Purists will always want the Worsted yarn to be very specially prepared with cut ends always in the same position, but this is seldom possible in practise in commercial preparation, so the word semi-worsted abounds in spinning parlance. Woollen yarns are ideal for knitting, the yarn is very open and will help to make cosy and warm fabrics, often by knitting, but could be used in weaving loftier cloth such as tweed. All the fibres are all used so the yarn isn’t completely smooth, fine, or strong but it is a very economic use of wool as almost all the fibre is used. Worsted yarns are ideal for weaving, the yarn is thin and strong and makes excellent cloth for suiting and fine goods, it is more expensive as only the best/long fibres are selected so generally thought of a prestige product. The Harris tweed ones are typical in their mixed colours,fairly thickly spun but they pull apart with ease pictured alongside some jacob fibre – spun from a rolag with a long draw, similar weight, both fairly typical of a general purpose yarn. Rubia tinctorium and Rubia cordifolia are the usual botanical names but various species are known by lots of different names, and they are related to plants such as Lady’s Bedstraw and Cleavers which contain the same colourings although in a much lesser quantity. 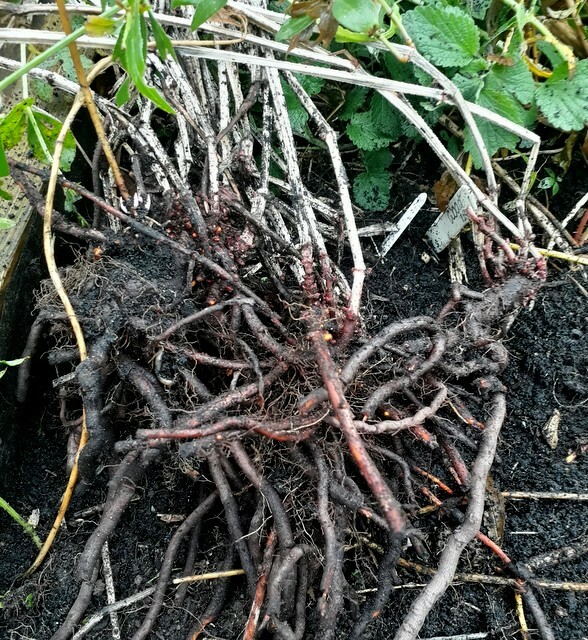 It takes about three years for the roots to grow to a good size and are harvested carefully, they break easily and each small piece is capable or growing again, so it is considered a bit of a weed in many places although perhaps in agricultural terms a boon. 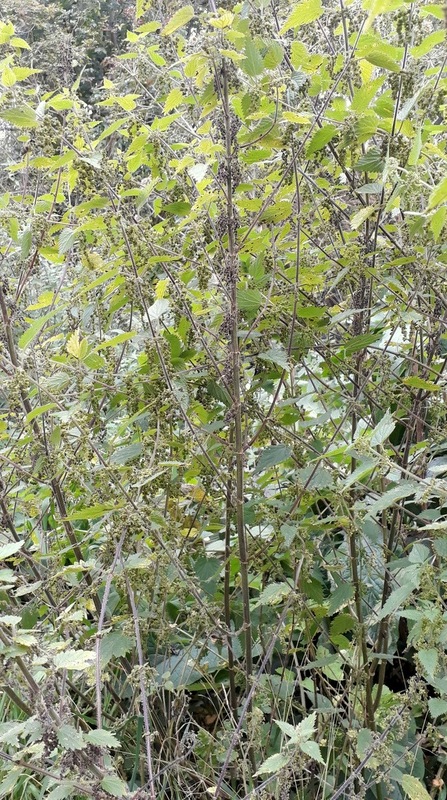 The leaves and stalks are full of tiny prickles and can cause allergic reactions in some people. Uprooting can happen at almost anytime, but early autumn is popular as the leaves die back and allow easier access to the roots. 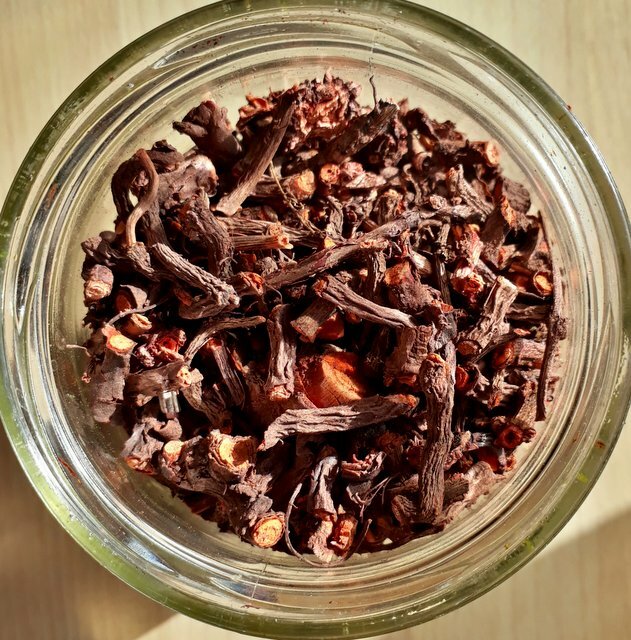 But now it’s time to dye, Madder contains a range of active ingredients but the chief one is alizarin and can with careful dyeing produce colours from pale pinks and peaches through tans and oranges to tomato reds and bright reds to almost dark maroons and grey purples. It can be very temperamental to work with with many factors affecting the colour responses, for example , pH values – acid to alkali, to heating for too long or too high, for hard or soft water, for short or long soaking, for fast work or long slow fermentation. That is part of the frustration but also the magic with many natural dyes, I suspect the charm is in the challenge for the dyer, certainly for me. I’ve worked with madder on wool in lots of different ways, but a usual ( and almost guaranteed to get some good colours) method follows. The wool should be mordanted first using about 15% – 20% potash alum to weight of dry fibre this is a little higher than for usual mordanting, but the madder needs it to get a full depth of colour. Dissolve the alum in some hot water, add to the pot with plenty of extra water, add the scoured and skeined yarn and simmer gently for about an hour or so, leave to cool in the pot overnight, I’ve found that removing the skein and allowing it to dry for a few days, or weeks if possible works well, but remember to rinse and soak the skein before any dyeing. Use about 150% dried root to dry weight of yarn and about 5% Calcium carbonate, madder appreciates hard water. Scald the madder roots and let sit a minute, drain the liquid, and repeat.This liquid will be quite orange, it can be used to make peaches and light colours, but it is worthwhile to remove the “orange” dye if you are trying to get a “redder” colour range. This stage isn’t essential but it does seem to speed up the dyeing process. 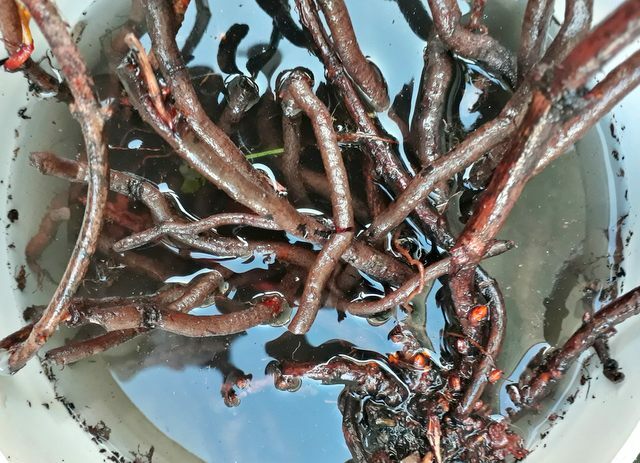 Put the roots in a large pan with the calcium carbonate and plenty of water, heat very gently for about 30 mins and the colour will start to bleed out. I add the yarn at this stage, but some prefer to strain the roots off, put them in a net and then replace in the pan, but I find that the pieces of root don’t tend to stick to the yarn and are easily removed at the end of the dyeing. Allow to stay warm for a few hours, very gentle heat is better, but don’t let it get above a simmer and below is ideal. Higher temperatures kill the red and give browns, perfectly good colours but not the sought after madder oranges and reds. I let the yarn sit in the pot overnight, making sure that it is well covered with extra water if needed. Check the colour next day, if not deep enough you can warm for another 3 – 5 hours, this can be repeated for many days and the colour will gradually increase. It is also possible just to let the pot sit for a few weeks without heat , to allow the madder to ferment, this is a good way to get decent reds in a very economic way. 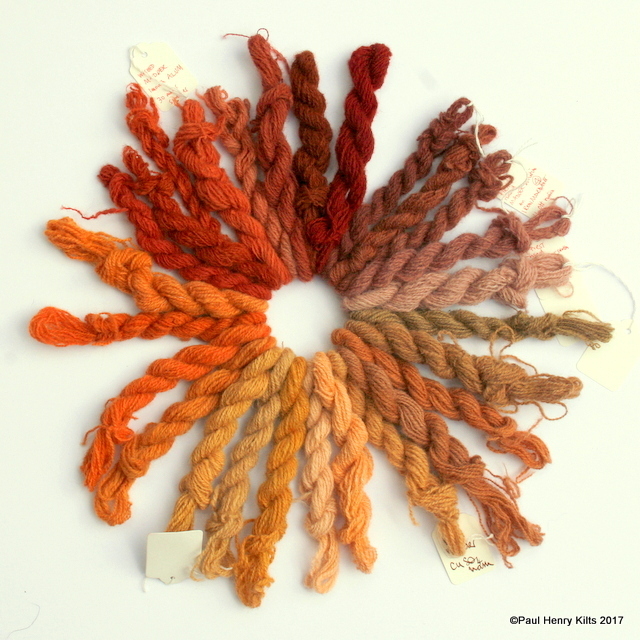 If the yarn still has an orange tint you can rinse the skein in a low alkali solution – I use ammonia or washing soda, but be careful to limit this as it will begin to breakdown the wool if exposed to a strong solution or for too long, and always make sure it will well rinsed. If things go to plan you should see a gentle change of tone to a cleaner red and less yellow colour. 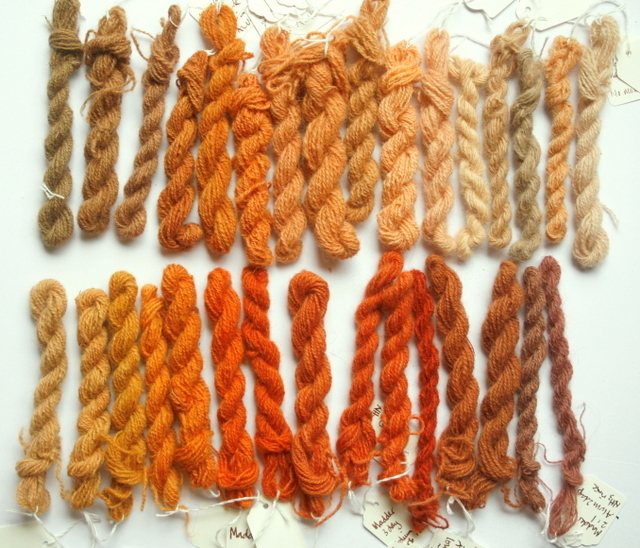 Conversely if you give the skein an acid rinse – vinegar to citric acid – more yellow will show. You can put the skein back in the dye pot for deeper colours if wished. Allow the skein to dry overnight or longer, without rinsing , this seems to help the madder to set properly on the fibres. 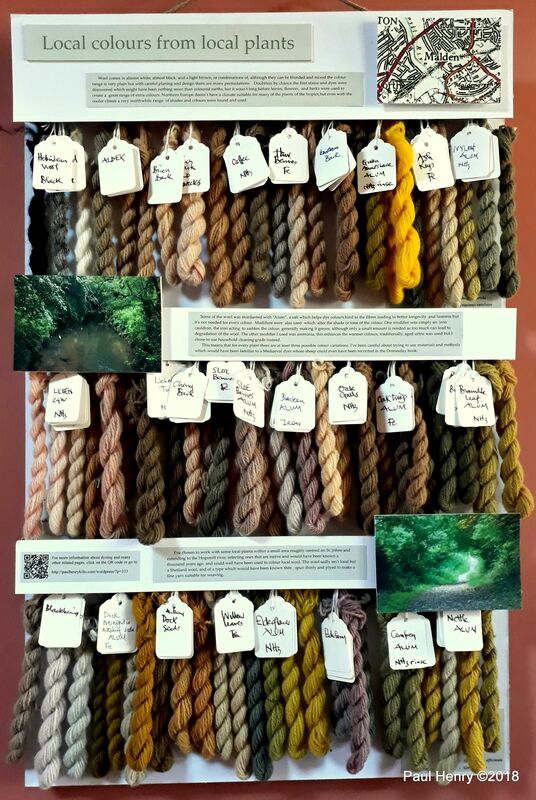 This is a good basic way of dyeing with madder , but there are lots of variations possible and every dyer has their own pet methods. A few key things to remember, madder doesn’t like to get too hot, it prefers a slightly alkali environment and it’s quite happy to sit for a long time, in fact one of the best reds I’ve got was from a skein that I had forgotten in a dye pot for about 4 weeks, and some people even work with cold madder dyeing over a month or so with excellent results. Other things to note, the smaller the madder is ground the faster the colouring, I’ve used finely ground or finely chopped orcomplete roots with satisfactory results, but I find the ground dust is a little harder to wash out. 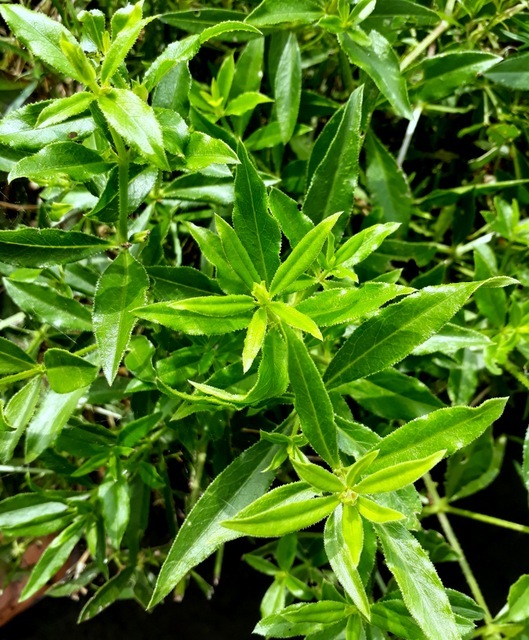 There are different grades of madder, usually from different parts to the world, some of my most reliable results have been from Iranian madder pieces, but my recent tests from London grown madder in school playgrounds has restored my faith in local fresh sources as well. 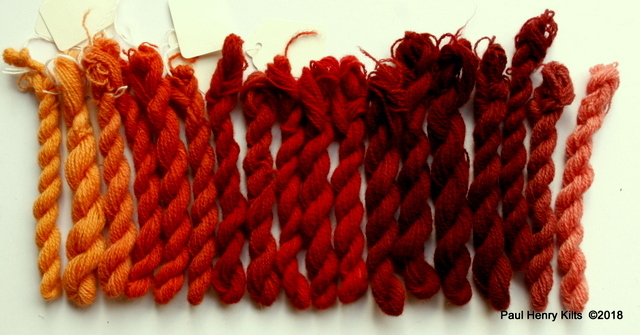 Modifying rinses is a great way of adjusting tones or tints of madder dyed fibre. A short soak in an iron rich bath will sadden the original colour making it greyer or duller, with an additional alkali rinse madder colours can turn towards the purples. Acids will tend to warm up colours to a lighter or more golden hue. Tannins will tend to make thing browner and in the presence of iron grey to black shades are possible. 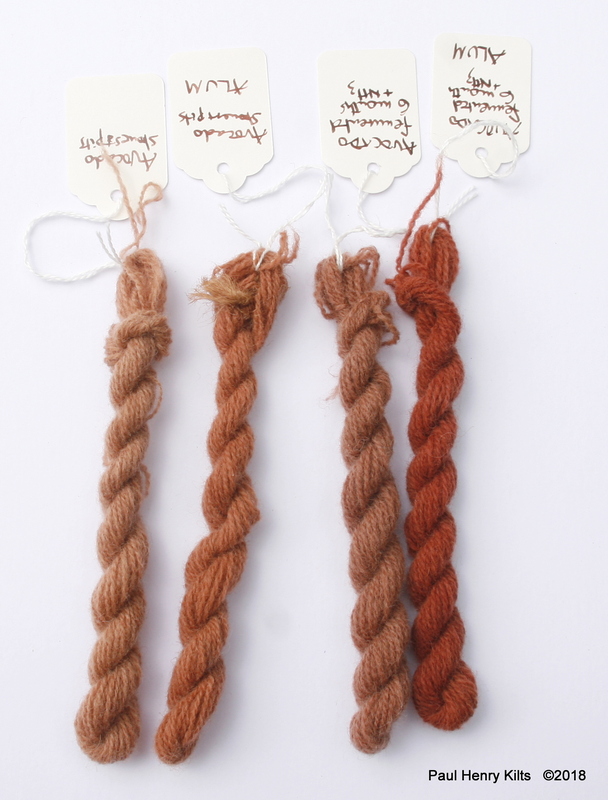 Madder is a wonderful resource and worth taking time to investigate the incredible range of colours possible, for me wool offers the greatest range, but silk, linen, and cotton is worth a look as well. Cotton with madder needed a curious and very long dyeing process with perhaps over 25 different and subsequent stages, including oil, blood and dung to make the famous Turkey red much loved in India, I’m prepared to give that a miss, for the moment at least. 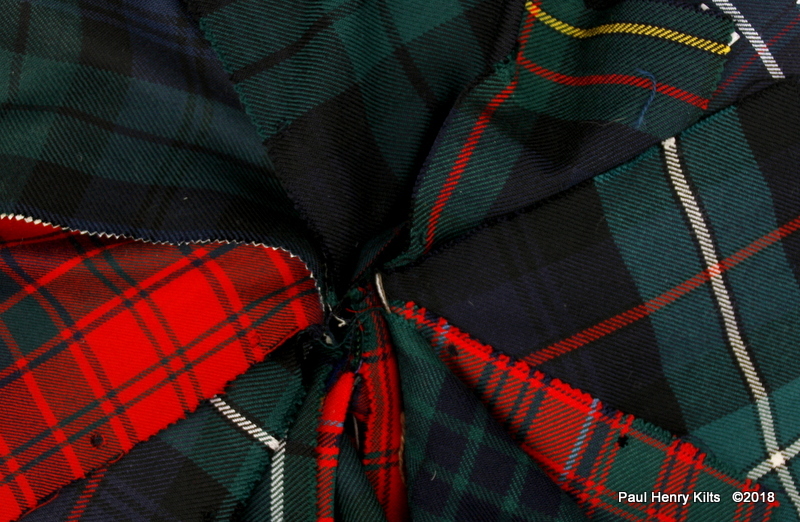 What makes a tartan ? There is often debate about what a tartan actually is, and how it differs from a check , and certainly in America there is usually a misunderstanding about plaids, checks, and tartans. Of course there are grey areas but essentially there is nothing between different them. A tartan is often defined as a pattern or cloth that has multiple stripes of different colours which cross at right angles forming a grid or network of lines and squares. A tartan does not need to recognised or registered by any authority to be known as such, and although it is most easily achieved through weaving, doesn’t even have to be realised on cloth. No one really knows exactly when weaving first began, certainly many thousands of years BC, in many different parts of the world, but we can speculate that once the process was mastered it would have been fairly easy to vary the cloth by adding stripes of different wools or different colours, if this was done on the warp threads as well as the weft, then a series of grids and squares would naturally appear. Some of the earliest examples of repeating woven patterns come from the Tarim mummies from central Asia, north of Tibet, dating from about 2000 BC, and these were so expertly done one must imagine that the skill of weaving was already well advanced. 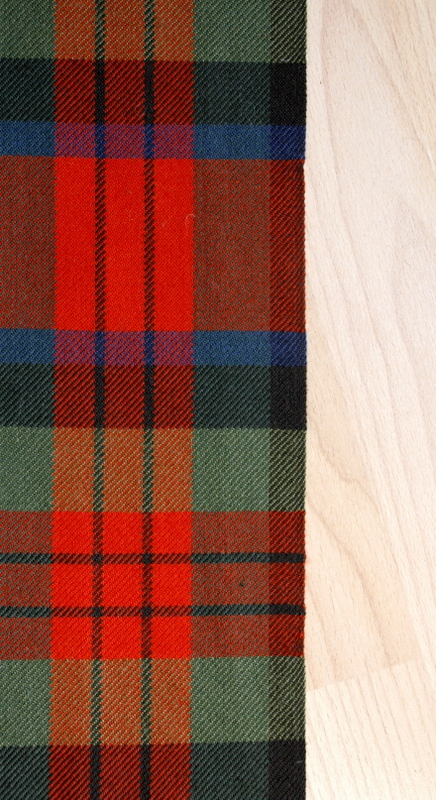 At its simplest you could have two colours with equal spacing and you have the basic tartan pattern, seen in many places, but a well known tartan one is the Rob Roy tartan. Known in America as the Buffalo plaid – said to have been created there by the Woolrich Mill in central Pennsylvania around 1856 but the idea of a simple repeating unit started a very long time before that. Gingham , which has the same design although usually smaller squares dates from the early 17th century in England. Going back much further one of the first checked or tartan fabrics found in the United Kingdom; the Falkirk tartan is a perfect example of fine weaving in just two colours, both undyed but a dark brown and a creamy white from different sheep. Taking the idea of different coloured stripes and repeating them with different widths, broad and narrow a whole new range of possibilities opens up, even with just the two colours. With the crossing of the stripes a third colour, a 50% mix of both original colours appears. This is an important part of any woven design and sets it apart from other printed designs. Adding a third colour and suddenly a whole realm of patterns is unlocked, with two colours the overlap creates a third, with three colours there are six total options and with four colours you the get ten possibilities . 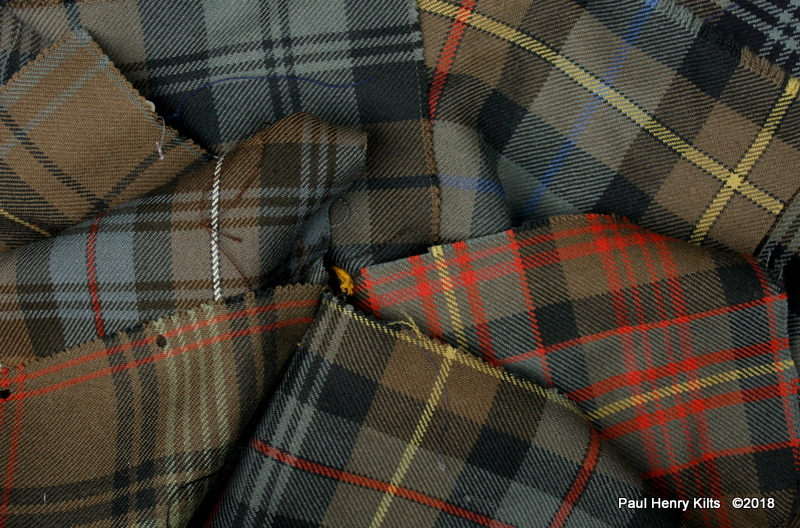 The idea that historically tartans were all named and represent families is not true, the fabrics woven in Scotland were really produced from the local wools and dyes in each area and as the production of yarn and cloth was so labour intensive there would have been little choice other than to wear the local fabric, which of course would most likely have been family or at least district based. 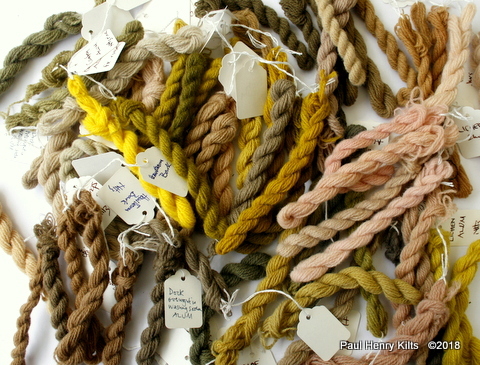 The idea that local dyes were dull is mistaken, a wide range range of colours is possible even from a limited geographic area and there is reasonable evidence that additional dye colours were being imported from at least the early 1500’s which would have given the weaver an almost complete range of colours to work with. 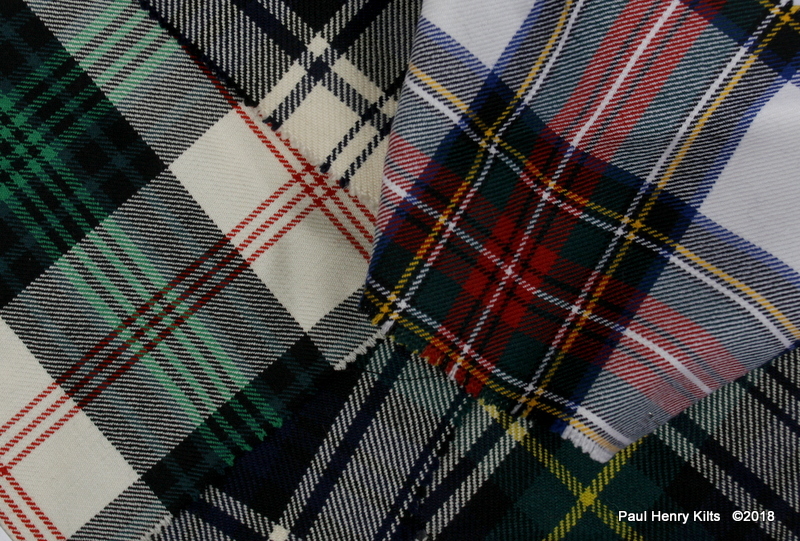 Author paulhenryPosted on 01/09/2018 22/01/2019 Categories tartanTags tartanLeave a comment on What makes a tartan ? Wool comes in almost white, almost black, and a light brown, or combinations of, although they can be blended and mixed the colour range is very plain but with careful planing and design there are many permutations . Doubtless by chance the first stains and dyes were discovered which might have been nothing more than coloured earths, but it wasn’t long before leaves, flowers, and barks were used to create a great range of extra colours. Northern Europe doesn’t have a climate suitable for many of the plants of the tropics,but even with the cooler climes a very worthwhile range of shades and colours were found and used. I’ve chosen to work with some local plants within a small area roughly centred on St. Johns and extending to the Hogsmill river, selecting ones that are native and would have been known a thousand years ago, and could well have been used to colour local wool. The wool sadly isn’t local but a Shetland wool, and of a type which would have been known then , spun thinly and plyed to make a fine yarn suitable for weaving. Some of the wool was mordanted with “Alum”, a salt which helps dye colours bind to the fibres leading to better longevity and fastness but it’s not needed for every colour. Modifiers were also used which alter the shade or tone of the colour. One modifier was simply an iron cauldron, the iron acting to sadden the colour, generally making it greyer, although only a small amount is needed as too much can lead to degradation of the wool. The other modifier I used was ammonia, this enhances the warmer colours, traditionally, aged urine was used but I chose to use household cleaning grade instead. This means that for every plant there are at least three possible colour variations. I’ve been careful about trying to use materials and methods which would have been familiar to a Mediaeval dyer whose sheep could even have been recorded in the Domesday book. 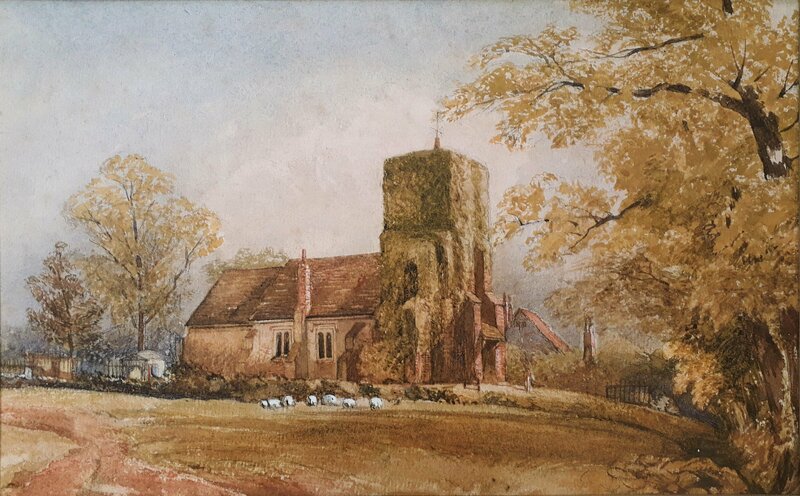 And I must add the watercolour painting that I first saw last year in the display at the Church which gave me the idea of the dyeing project, just and because I noticed the sheep! A year ago I saw some references to avocados giving a delicate pink colour without the use of any additional mordants, relying on the tannin contained within the stone or skins, I was fascinated and shortly gave it a test. There were several methods advocated , generally long soaks in water and ammonia mixes perhaps for several months, or long simmering at low temperatures. 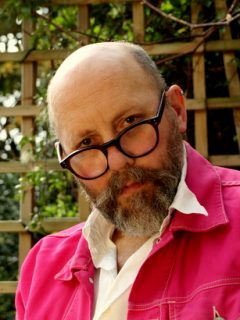 I tried a few tests and was a bit disappointed with the results, pale pinks but nothing that I thought I couldn’t have got with a little bit of exhaust cochineal, so the idea of using avocados didn’t last. Fast forward about 9 months and I found an old large jar filled with avocado bits and rather dark red liquid, so certainly worth using with some yarn. I made two small skeins of shetland wool, one alum mordanted and the other untreated, soaked them and pushed them into the jar making sure they were well covered and left them overnight, and indeed for a few days. The liquid didn’t feel soapy so I didn’t think there was much alkali left, but I didn’t check the pH. By chance it was tricolore salad for supper, so I saved the skins and pits , washed to remove any flesh, smashed the pits, let them dry and the next day very slowly simmered them for about 8 hours or so, topping up with water as needed, and pleased to see a very strong colour appearing, almost as much as the 9 month jar. With this revelation I decided it was certainly worth using the avocados for a little more research. 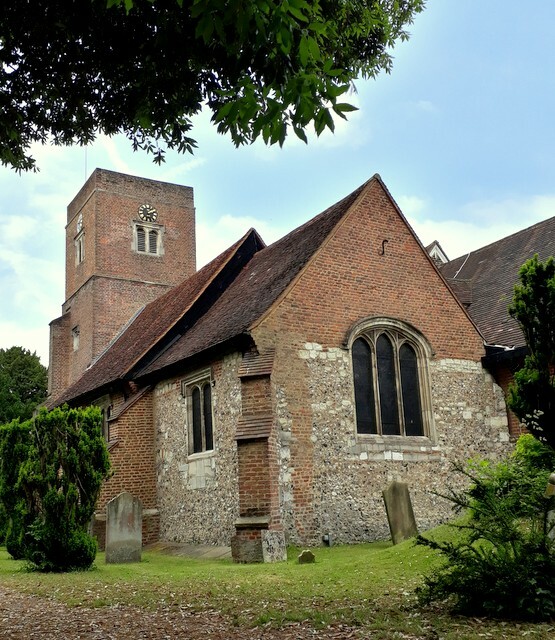 For a local Heritage Day event, the sort that buildings are open to visitors to look around and explore, perhaps with a guide and with extra historical explanation, I decided that I would contribute to the local church’s one. Parts of it date back to Saxon times, but the bulk of it was rebuilt around 1611, enlarged in Victorian times, and further enhanced in early 2000’s. It is situated in a very pleasant churchyard with old graves and a few tombs, surrounded by meadows and fields. The grounds are carefully managed in a conservation way with a good sprinkling of unusual and special native flowers and fauna. It sits just above the Hogsmill, a tributary of the Thames, it’s largest claim to fame is that it was the inspiration for “Ophelia” by Holman Hunt. 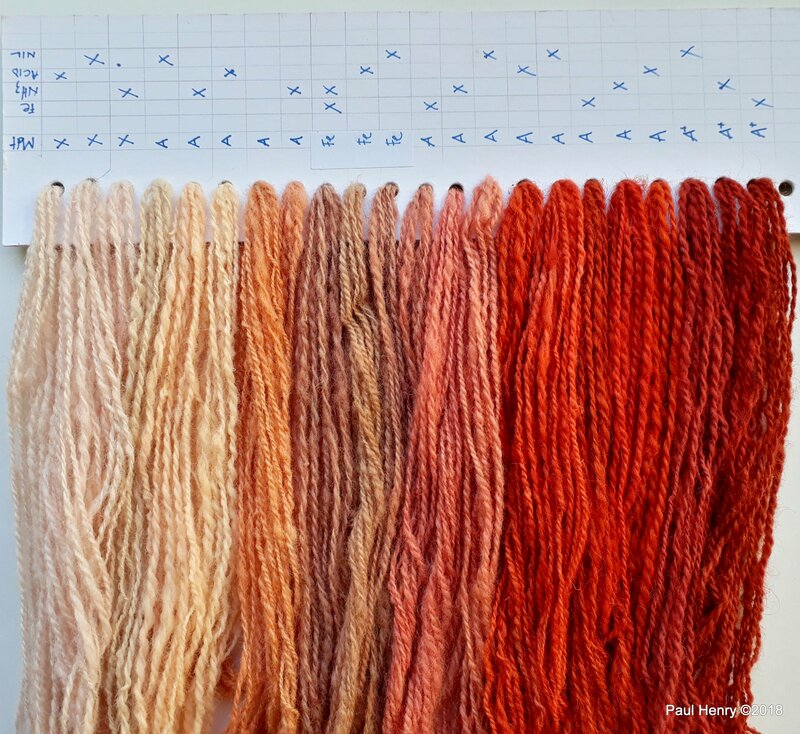 I had the idea that I would create a selection of dyed skeins of wool, showing the range of colours possible even within a small area. I decided that I would have three skeins of each, one as normally, and then the others modified, either with iron or with ammonia. These choices were historically correct, the iron “saddens” colours, making them greyer or darker, and the ammonia helps to make some colour brighter and changes other very dramatically but increasing the pH.Iron could have been introduced by dyeing in an iron pot, it takes very little to have an effect, and the ammonia could have been nothing more complicated than aged urine. The iron rinse was made by keeping iron nails in a light vinegar solution for several months, cooking it up every so often, admittedly not terribly scientific but it works, and the ammonia was simply a standard household cleaning product rather diluted. There are lots of other modifiers around but I wanted to keep it fairly simple and reasonably possible for a simple basic dyer of perhaps 500 years ago. Working almost everyday with woven cloth makes you very aware of the type of edge that you have, ideally making kilts you want to have a finished edge at the bottom of the kilt, but one that isn’t actually hemmed. The traditional shuttle weaving produced a selvedge ( self-edge), a term that is widely and also a little inaccurately used today. A selvedge by actual definition is the clean edge formed when the shuttle on the loom goes back and forwards with a continuous and unbroken thread ; this method when carefully managed produces a beautifully pure edge with no added weight of change of feel, it is the most desired edge for kiltmakers. Of course it isn’t always quite that simple, over the years kilting cloth has been produced on different types of looms and most weavers today use high speed looms which no longer can make a true selvedge. These looms can weave in a few hours what a traditional hand weaver would have woven in a week or more. With the change of loom there has been a change of fabric edge. 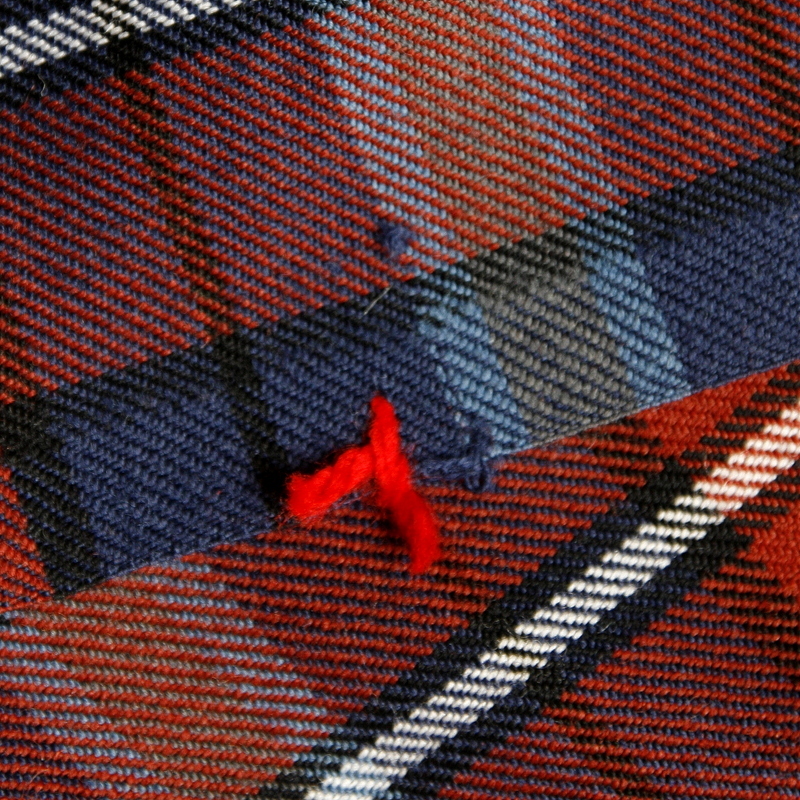 The most usual one for kilts is now called a tuck edge where one thread is woven at a time and then folded back upon itself for about a cm and then the next thread is introduced and forms the next line of cloth, working with a single length of thread is very much faster and looms use a variety of high speed methods for shooting the thread across including compressed air or even water, but the key thing is that a shuttle is no longer needed. This edge is slightly firmer and often a little more stable, but it has a little line of cut threads about 1 cm from the actual edge, these are not terribly noticeable depending on which side of the cloth is used. Most tartan weavers now use this edge for the majority of their production. Another edge that is sometimes seen is a leno edge, which has a distinctive extra few twisted threads often white at the edge and a fringe from the uncut weft threads,this is the possibly the faster weaving method but it does mean that any kilt fabric will have to be hemmed. One excellent Scottish weaver has worked out how to have a selvedge on one side and a leno on the other, they use this on single width tartan and this means that a kiltmaker still has the chance to use a good edge at the bottom of the kilt, and the leno edge is cut off and used for the waistband, and hidden from view. While a selvedge is the favourite it is not always the easiest to produce these days and is now more expensive with only a few weavers offering this. When it is well done it is excellent, but some weavers try it and fail miserably, this is an example of a rushed and imperfect selvedge, however with a lot of ironing, steam and pulling and stretching it can be made a little better, and if it wasn’t for a special order it would have been returned, a kiltmaker has enough to do without trying to fix a weaving problem. Often I’d rather have a tuck edge than having to spend time remedying a weaver’s problems. Watching a weaver work is a wonderful experience, seeing the magic work of converting a mass of threads into a cloth is fascinating. Traditional looms for weaving tartan haven’t changed very much in hundreds of years, a strong wooden box like construction , but actually very simple, relying on the skill of the weaver and a flying shuttle ,it was the only way of producing any from of tartan until the beginning of the 19th century. Mechanisation happened and the introduction of power looms made the mass production of tartan possible, dobby looms which followed around the 1850’s revolutionised the speed of weaving and the possibility of more complex designs. 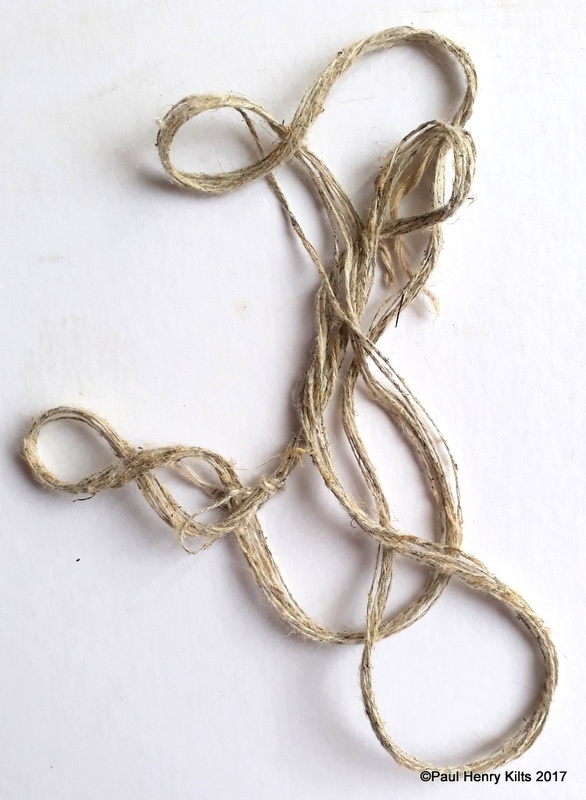 One last little nugget; occasionally I see a thread that has been attached to a length of cloth this tells me that there is a fault of some sort, the thread is always at the edge ( this time a tuck edge) and the flaw will be roughly in line with it, when the cloth is rolled up it is easy to see how many threads to judge what sort of quality to expect, this is supposed to be the origin of the phrase “no strings attached” meaning that the cloth was good quality and that no extra work was needed to put it right! There is a long history of harvesting plants to extract fibre, the well known ones are cotton and linen, perhaps hemp, jute, and sisal , but nettle was very well known and there evidence that it has been used at least for the last 3000 years, and possibly much longer, everywhere from Denmark to Ancient Egypt. 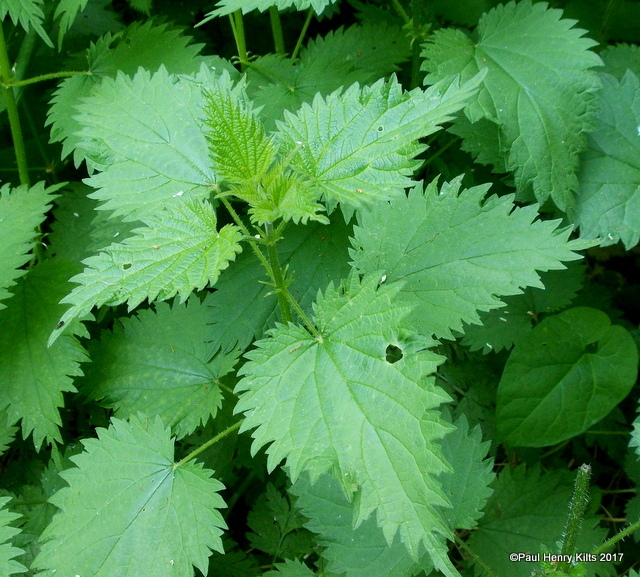 Nettles grow wild and don’t need any special treatment and survive in almost any soil. They grow tall, up to 5′ and are perennial and self seed very readily. Harvesting often takes place in the autumn, stems are cut near the ground and the leaves rubbed off. Gloves are really needed – they are called stinging nettles for a good reason. 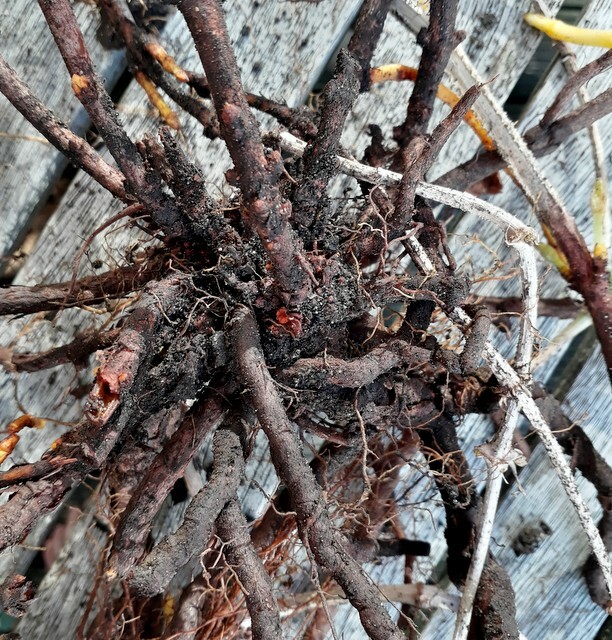 The stems are gathered together and left to rett on the ground for a few weeks allowing bacteria to start breaking down the woody parts of the stalks to reveal the valued fibre. The stems are then gently broken and the outer skin can be peeled off and the inner core removed and disposed of. 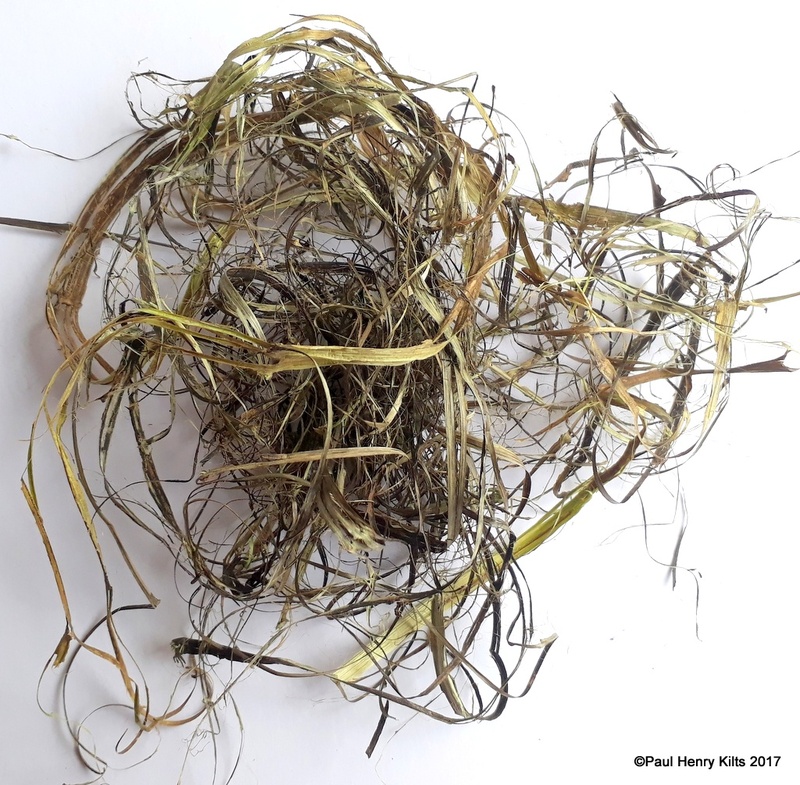 It will look like a mass of straw, but this is the important fibre, by scraping, flexing, rubbing between hands, and combing the fine fibres will be revealed, and can then be spun. If there are a lot of shorter lengths carding is probably a better idea, in the same way that rolags are created with wool. There will still be a very definite green colour on the fibre during spinning and also shorter random bits of stem, it’s usually easier just to carry on than waste extra time with more processing, as the little bits will fall out either in the spinning or in the final washing. My favoured spinning is with a drop spindle, it’s easy to control especially for small quantities of fibre. The fibre is fairly strong, but creating a 2 ply evens out any variations and makes a much more balanced final yarn. It will look fairly coarse with lots of small stem pieces, but they will disappear with the next step. The skein needs to be washed before it is properly ready to use, it is boiled in a weak solution of washing soda for about hour, it’s easy to check on the progress, the yarn will lighten in colour, lots of the stray bits of stem will vanish, and yarn itself will become much softer. It will need to be washed at the end with some normal washing liquid and well rinsed, after it is dry , it’s ready to use. 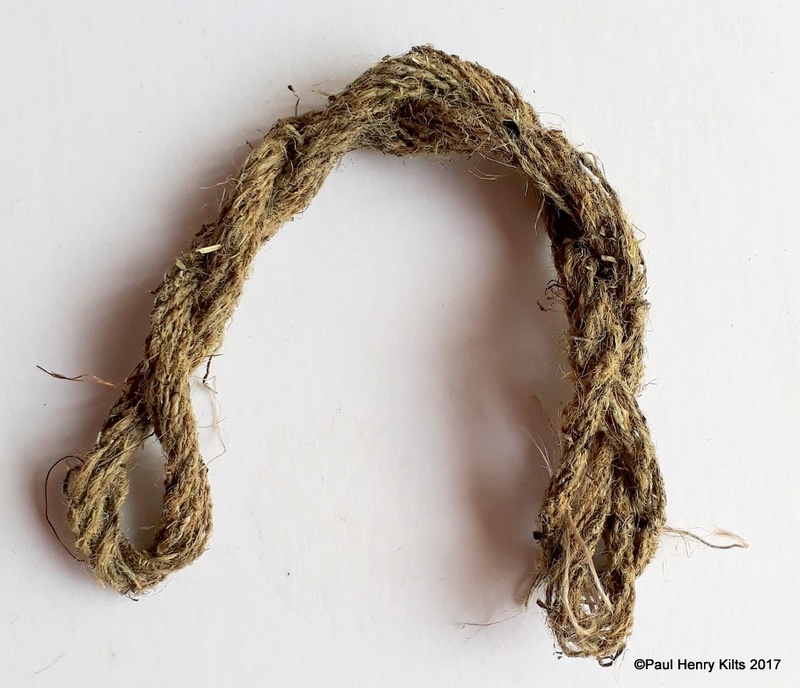 There is a lot of work needed to gain a small amount of fibre,there is a huge amount of waste, but on the plus side it is essentially free to harvest,needs no special tools to convert the raw stems into fibre and it makes a very strong yarn, being very similar to flax and linen. I’d be very happy to make more given enough time, it’s certainly been a very useful project. Safflower is often called false saffron, it looks a little like true saffron, and does impart colour in cooking, but little else than that, certainly none of the wonderful saffron taste. 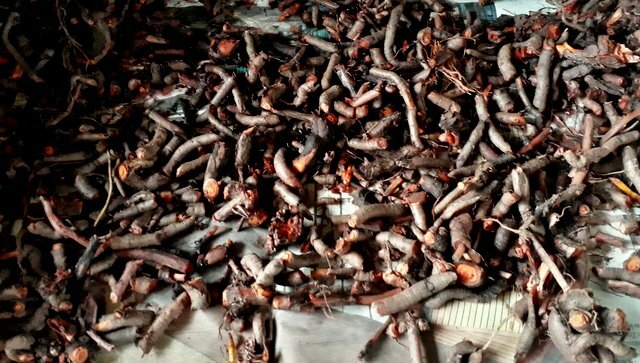 I know that it produces oil from the seeds and can also be used as a dye, but that it is fairly fugitive, so in many ways really only for something temporary. 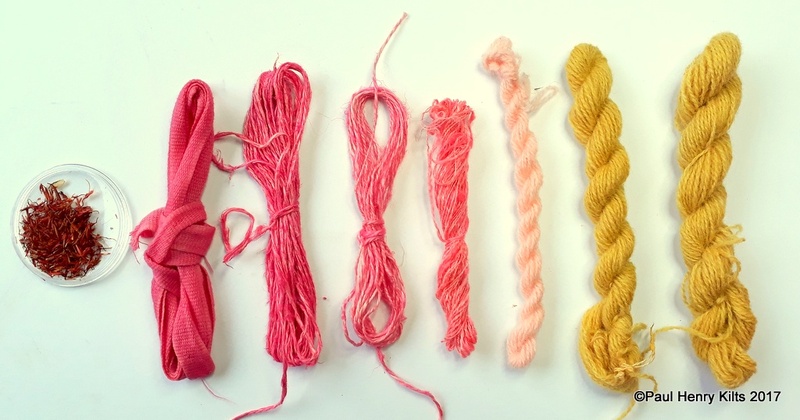 Another of it’s unusual properties is that with careful pH manipulation it can go from a rather nondescript yellow on wool, to wonderful bright pinks on silk, linen, and cotton. In fact when cotton tape is dyed with safflower the result is “red tape” that wonderful legal item, that binds important and pressing documents together. I was given a large pot of it from a friends travels so it seemed a perfect time to give it a try. First the petals need to be soaked and rinsed a few times to remove most of the yellow colouring, this can be kept and used, but with so many other far more satisfying yellows from a huge range of other plants, I’m not sure why you would! The cotton and linen will take on a wonderful clean pink, and the silk a slightly more coral version, wool however barely colours, perhaps if you are lucky a very delicate baby pink. There is a technique where you use cotton fabric as a sacrificial /interim method, where after you have got pink cotton, you then re soak it in alkali to remove the pink, remove the cotton, re acidify the bath and then dye silk to get pink. I can’t say if it works, but it’s a clever idea, however a little bit of cochineal to my mind seems a much easier way of going about getting pink silk, and although it might be a little more expensive there is very little procedure and messing about, and not least the cochineal is permanent as well!